SPE ANTEC® 2019 INSPIRE Agenda now available! 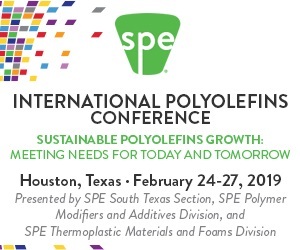 ANTEC® 2019, produced by SPE-Inspiring Plastics Professionals, is the largest, most respected and well-known technical conference in the plastics industry. It’s where classroom theory connects with real world solutions. This year, ANTEC® 2019 has been reformatted into two programs, INSPIRE and INSIGHT, to best represent the ideas and trends shaping our plastics industry. At ANTEC® 2019 INSPIRE, 550+ technical and business papers and 60&343; marketing presentations, spanning Monday thru Wednesday midday, you will be able to enjoy the traditional ANTEC® that you know and love – complete with networking and student events and exhibitor receptions. The INSPIRE agenda is now available and can be found here.